Chased by clubs in Europe and particularly by South African side Ajax Cape Town, Latif Blessing, Liberty Profession top gun, chose to follow his very own American dream by agreeing to a 3-year contract with Major League Soccer side Sporting Kansas City. The deal for the 19-year-old ace has an option for a 4th year subject to a medical. 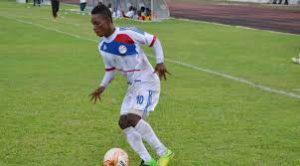 One of the shooting stars of Ghanaian football, the youngster emerged as top scorer of the Ghana Premier League in the just concluded 201/2016 season with 17 goals and was voted the league’s best player. With aspiration to represent Ghana at the 2017 Africa Cup of Nations in Gabon, the young ace is taking a risk as some coaches discount players in MLS as they fill out their roster spots. But with players like Harrison Aful of Columbus crew and David Akam of the Chicago Fire getting regular call-ups to represent Ghana, it doesn’t seem as if playing in America will affect his national team prospects if he performs well.